Did that doctor pay to hide some bad reviews on RateMDs, the online physician rating system? You wouldn't know. Nor would you know if a doctor hired a reputation management service to boost the volume of positive reviews. Online reputation management is an emerging industry with companies offering a variety of services to professionals who find themselves ranked on rating sites with no ability to opt out and with no control over the anonymous comments that can affect their reputation. The fact that those reputation management tools exist came as a shock to Dr. Sukhbir Singh, a gynecologist at The Ottawa Hospital. Singh was already grappling with a negative review posted on his RateMDs page — a posting he discovered last weekend after an anonymous person claimed he had harmed them with a procedure that he doesn't do. Then, just as suddenly, the posting vanished. "This is crazy. None of this makes sense to me," he said. "I feel this is akin to cyberbullying." In the middle of all of that a sales representative from RateMDs contacted him offering "reputation management tools" for a fee. The service includes the ability to keep up to three comments hidden from public view. "That just made me sick to my stomach," he said. "It doesn't seem that in a public health-care system that I should be marketing myself, that I should be protecting my reputation and paying an independent private company to do that work." RateMDs offers doctors two special plans to enhance their presence on the site. The "Promoted" package costs $ 179 US per month and includes banner ads that will appear on competing doctor's pages. And for $ 359 US per month the doctor can buy the "Promoted plus" option. Both packages allow doctors to hide up to three unfavourable comments — a feature called "Ratings Manager." But if a doctor stops paying, those unfavourable ratings will reappear. "If a user unsubscribes from the Promoted or Promoted Plus plans, he or she will no longer receive the benefits associated with that subscription," Goodridge said via email. 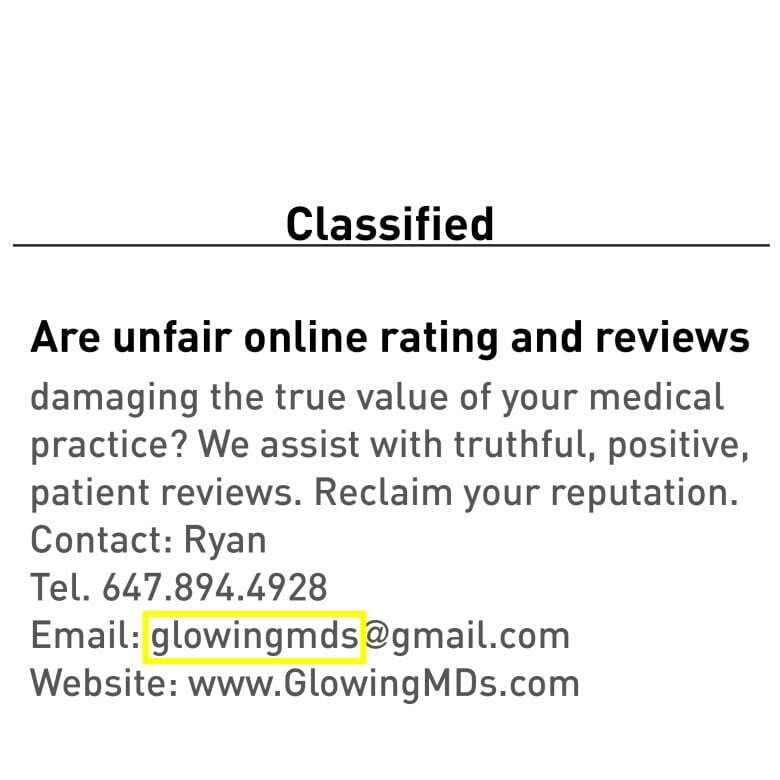 "You're held a little bit to ransom because the second you stop paying that $ 200 per month, those hidden reviews come back online," said Ryan Forman, who runs a company called GlowingMDs that helps doctors manage their RateMDs profiles. Forman's company advertises its service to doctors with the line: "Reclaim your reputation." 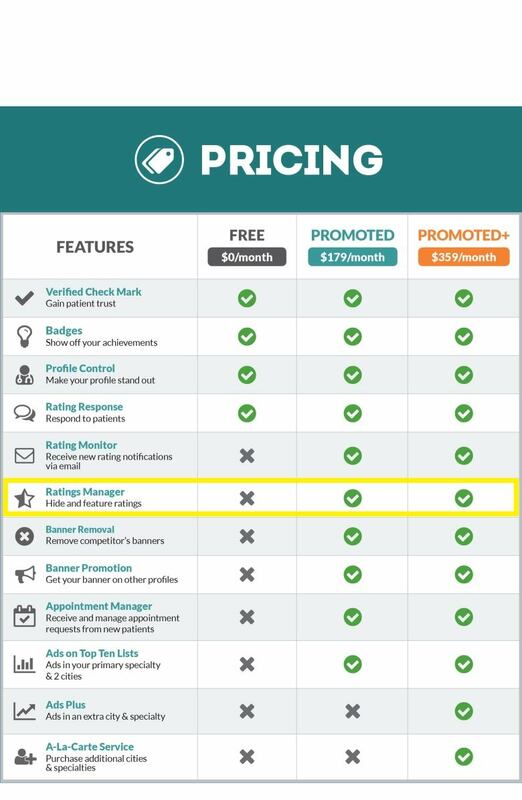 For a monthly fee of $ 229 plus HST the company provides a ratings template that doctors offer to patients to complete after an appointment. "We then take all of those reviews, good or bad, from the doctor, and we then post it to RateMDs in effect on the doctor's behalf." "We're not able to remove any negative reviews but what we can do is post legitimate reviews that come through the doctor and hopefully improve their RateMDs profile," said Forman. Over at RateMDs, Goodridge said he knows that companies are selling reputation management services that target the online site. "We're certainly aware that there are a number of companies that support health care providers in soliciting patient reviews and in assisting with posting those reviews," wrote Goodridge, adding that RateMDs has a system to disallow testimonials from suspicious sources. "RateMDs.com utilizes a variety of proprietary methods to identify and remove programmatically-generated reviews or reviews originating from suspicious sources." But Forman said RateMDs filters have not prevented his company from posting multiple patient testimonials for a single doctor. "We have had experience where they have picked up where we are putting more than one review for a doctor from the same location but the truth is our software circumvents that," said Forman, adding he simply tweaks his software to get around the RateMDs filters. So could anyone get the software and start posting whatever they wanted as many times as they wanted? "Yes, I think if they were tech-savvy they probably could," Forman said." It's not software that we developed, it's software that's out there on the internet so, yeah, they could definitely do it on their own." RateMDs is a free and open forum. That means anyone can say anything about any doctor. Just write a comment, click on each of the four rating stars and hit "Rate this doctor." The site does not ask for a name, email address or phone number. The doctor has no control over whether he or she appears on the site and there is no way to remove their page once it's been posted. A study published in the Journal of Medical Internet Research found that more than half of Canada's physicians have been rated on the site. "Overall, physicians are rated positively," said study author Dr. Jessica Lui, a clinical investigator at the University of Toronto. "We did find there were differences in the likelihood of receiving a positive rating depending on what type of medicine you practiced." But how useful are those ratings for patients especially if there are ways for doctors to boost their positive ratings? And right now RateMDs does not post any warnings about physicians who have been disciplined by the medical regulatory colleges. "If a provider has active or past disciplinary actions on their file they are not visible on their RateMDs.com profiles," Goodridge wrote. The result? Doctors who have committed professional misconduct including sexual abuse of patients can still have glowing reviews on RateMDs. "Providing transparency on disciplinary actions is a feature we continue to pursue on behalf of our audience," wrote Goodridge. "At the moment, the limited availability of this data from the disparate colleges does not make this practical. RateMDs.com hopes to add this information in the near future by partnering with regulatory colleges if they are willing." There is also little transparency when it comes to anonymous accusations posted on RateMDs. Several doctors told CBC News about bad experiences including malicious postings from disgruntled employees. And when patients do post negative reviews, the doctors pointed out that they can't tell their side of the story without breaking patient confidentiality. Forman started GlowingMDs after seeing some of those problems emerge in the medical clinics he manages. "There's definitely a need for the service," Forman said. "Their hands are tied in terms of what they can say and do on RateMDs"
Being rated without your consent can now happen to anyone. Doctors, lawyers, dog walkers — there is nothing preventing a company from setting up an online rating site and publishing anonymous reviews in any field — comments that will circulate on the internet forever. "There is, I think, a very real issue that has, in a way, run away on us because we do not have the laws that specifically address these situations," said Chantal Bernier, former federal privacy commissioner, now a privacy and cybersecurity counsel at Dentons Canada LLP. "The thorny issues it presents is the reconciliation between the right to information, the obligation of accountability on one side and privacy and reputation on the other." Bernier said there is a need to examine the legislative tools that will be required to manage those competing ethical issues. "Right now the remedies do not entirely correspond to the challenge."